Hello everyone, and Happy Easter Sunday! At least, I think it’s ‘happy’… This Hindu person isn’t sure about the Jesus death-and-resurrection timeline. Speaking of which, you may have noticed that The Sunday Social was missing last week, due to an unexpected hospital stay that lasted as long as Easter itself — before I go on, let me say that it wasn’t life-threatening and the patient is doing better. Said patient wasn’t me, but I was the plus-one who stayed in the hospital room tending to the patient’s needs. Our time in the hospital got me thinking of all the medical shows and hospital scenes from various K-dramas. 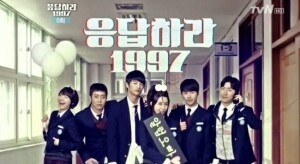 The one that I recalled the most was Reply 1997‘s Shi-won (Jung Eun-ji) forcing patient Yoon-jae (Seo In-guk) to give up his hospital bed for her. However, I was mainly just jealous that Yoon-jae at least got a cot — I had to sleep on the cold floor with only a straw mat and blanket for protection. Another drama I remembered was Joo Won-starrer Good Doctor, AKA the only decent medical K-drama I have ever seen. Yongpal, Doctor Stranger and Medical Top Team also sprung to mind, but the less said about them the better. Readers, do you think Good Doctor is the best of its genre? What other medical K-dramas have you enjoyed? How about hospital scenes in other K-dramas — do you have any particular scenes that you absolutely love? Let me know in the comments below!